The opening batsmen signed off last season with a career best seven for 20 at Derby and he began the new championship campaign with a five-wicket haul that earned his side a slender first innings lead. 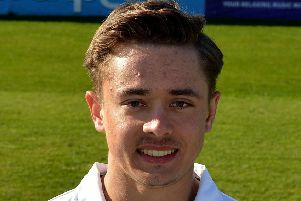 Reece swung the ball to take 5 for 47 and with Ravi Rampaul claiming 3 for 47, Durham were bowled out for 171, 26 behind Derbyshire who closed on 107 for 3, 133 in front, with Tom Lace unbeaten on 41. The morning session was always likely to be pivotal in the game and although Durham started well, Rampaul undermined them with two quick wickets in the space of three overs including the big one of Alex Lees. Nightwatchman Matt Salisbury had survived for nearly 50 minutes but he was undone by a short ball before Lees was caught on the crease for 32 after 143 minutes of watchful accumulation. Stuart Poynter played across the line at Tony Palladino and although Jack Burnham and Liam Trevaskis briefly raised Durham’s hopes of at least parity, three wickets in five overs tilted the game towards Derbyshire. Burnham flirted at a ball from Reece he should have left, and Trevaskis and James Weighell edged into the safe hands of Wayne Madsen at first slip. Only some muscular blows from Ben Raine, including a pulled six off Rampaul, denied Derbyshire a bigger advantage before he skied Reece to third man. The sun had been out for much of the day but the clouds rolled in to increase the demands on the batsmen and Derbyshire lost both openers before tea. 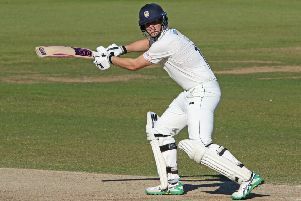 Reece avoided a pair but played slightly across the line at Salisbury and was caught at second slip before skipper Billy Godleman edged a loose drive at Raine. Durham should have had another wicket in the first over after the interval when Madsen on 11 edged Chris Rushworth but Lees failed to hang on at first slip. It was a bad miss and although it was not costly in terms of runs, it was another 12 overs before Lees made amends. Madsen’s attempted cut at Salisbury was well taken by Lees and Durham’s claim for a slip catch when Alex Hughes had scored seven were turned down after the umpires consulted. Durham will still fancy their chances if they take early wickets on day three but with Lace growing in confidence before bad light ended play 10 overs early, Derbyshire are well placed to build a sizeable lead.